Dreamworks has long been struggling to catch up to the efforts of Pixar and Disney. Jeffrey Katzenberg’s departure from Disney to Dreamworks created an odd sort of rivalry, one that Dreamworks never could equal. Starting with Kung Fu Panda and continuing with the recent How To Train Your Dragon [review here], Dreamworks seems that they might indeed be able to carve out their own respectable niche in the animation market. Jack Black’s grating obnoxiousness is perfect for the role of Po Panda, a large black and white fur-ball who is irreverent without being rude and intrusive without malicious intent. He is the son of a noodle-seller and is destined to continue in his father’s footsteps. But at night Po dreams of kung fu, of epic battles and an enigmatic warrior who happens to be large, furry, and a panda. His true destiny lies with the greatest of kung fu masters. One day it is announced that the new Dragon Warrior will be chosen. Po trudges up the hill to see the exhibition; all his favorite kung fu stars will be participating. In the process, he is accidentally chosen as the next Dragon Warrior by the venerable Oogway (Randall Duk Kim), the slow kung fu turtle. Master Shifu (Dustin Hoffman, channeling Yoda and Mufasa simultaneously) is not pleased: why wouldn’t one of his five warriors be chosen, particularly the impressive Tigress (Angelina Jolie)? Together Shifu and the five warriors encourage Po to quit, in an attempt to convince Master Oogway that another Dragon Warrior should be chosen. Plus, there is danger on the horizon as the dread Tai Lung (Ian McShane) is feared to be on the verge of escaping from prison. Surely only the Dragon Warrior, the one who is allowed to read the treasured and powerful Dragon Scroll, can defeat Tai Lung? The story is slight, but, like How to Train Your Dragon after it, is entrenched in a rich mythology deeply rooted in kung fu history. A loving pastiche of every kung fu movie, there are scenes and flashbacks that stitch together entertaining action moments in the style of the Shaw Brothers’ films. There is a good, though standard, message in Kung Fu Panda. Po hates himself, as he’s fat and clumsy and could never be a Dragon Warrior. But with determination and perseverance, and with the help of Master Shifu to find his hidden strengths, Po eventually learns to believe in himself. That said, the primary point of the film is to be entertaining. In this effort it succeeds very well. There are numerous action sequences, none very violent but all chaotic. The action slows down from time to time to allow a closer slow-mo view of a particularly nifty move. Occasionally the camera pulls back, showing off very impressive backdrops to the action. The landscapes are gorgeously crafted and fit perfectly with the epic kung fu battles. There are a number of name actors in the cast of voice characters (Jackie Chan, Seth Rogen, Lucy Liu, David Cross) but hardly any of them get more than two or three lines. David Cross’s Crane, one of the five warriors, has a slight dialogue with Po (in a scene betraying the film’s American ideas of personal ownership, at odds with the love of Chinese culture espoused by the bulk of the movie), but other than these few lines hardly anyone speaks much. Kung Fu Panda focuses on the action, and it does this impressively. Children will be entertained by the nicely choreographed action sequences and pretty artwork, and won’t be bothered with the story or characters (other than Po, who is lovably large). Adults will be able to appreciate the beauty and energy of the film, along with the constant references to martial arts movies of the past, and the story is sufficient enough to not be a drawback. 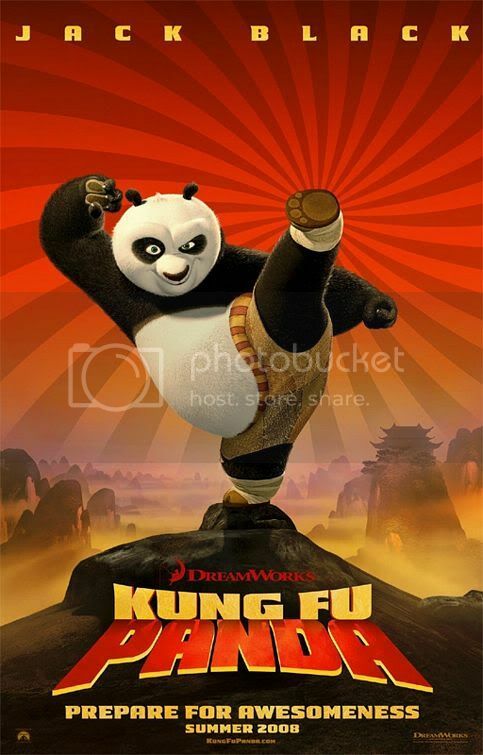 Kung Fu Panda, while not among the greatest of animated films, is certainly enjoyable, and a step in what appears to be the right direction for Dreamworks, whose How To Train Your Dragon improves and continues the trend. This entry was posted in 3 stars, 3.5 pirate flags, K, Movie Reviews, Pirate Flag Rating, Star Rating on April 29, 2010 by Tim Irwin.